Our journey, this month, has brought us to Thailand, a constitutional monarchy presently under King Maha Vajiralongkorn. 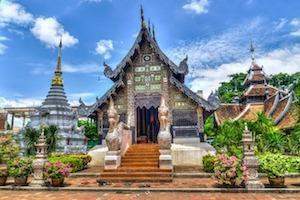 Thailand was formerly known as “Siam” and its history shows that the country’s culture was heavily influenced by India followed by China, Cambodia, Lao, and Burma. Thailand’s national religion, Theravada Buddhism, is central to modern Thai identity. Thailand is a strong rising economy and acts like an anchor economy to the nearby countries of Laos, Cambodia, and Myanmar. Thailand’s economy is the 2nd largest in Southeast Asia after Indonesia, and is heavily export-dependent, with exports accounting for more than two-thirds of the country’s gross domestic product (GDP). Major exports include rice, textiles and footwear, fishery products, rubber, jewelry, cars, computers, and electrical appliances. Tourism makes up about 6% of the economy, with Thailand having been the most visited country in Southeast Asia in 2013, according to the WTO. Thailand's attractions include diving, sandy beaches, hundreds of tropical islands, nightlife, archaeological sites, museums, hill tribes, flora and bird life, palaces, Buddhist temples and several World Heritage sites. Thai cuisine is famous worldwide for its enthusiastic use of fresh herbs and spices.Thai cuisine blends five fundamental tastes: sweet, spicy, sour, bitter, and salty. Common ingredients used in Thai cuisine include garlic, chilies, lime juice, lemongrass, coriander, and palm sugar. Fun Fact #1: You’re lucky that you know Bangkok as “Bangkok.” Its real name is one of the longest names of a place in the world, made up of Pali and Sanskrit root words: Krungthepmahanakhon Amonrattanakosin Mahintharayutthaya Mahadilokphop Noppharatratchathaniburirom Udomratchaniwetmahasathan Amonphimanawatansathit Sakkathattiyawitsanukamprasit. It means “City of Angels, Great City of Immortals, Magnificent City of the Nine Gems, Seat of the King, City of Royal Palaces, Home of Gods Incarnate, Erected by Visvakarman at Indra’s Behest. This is a Thai version of the famous Pocky sticks. Indulge in the crispy and creamy delight of Pejoy Matcha Green Tea with a matcha green tea cream filling which is encased in a crunchy biscuit shell. Pejoy Matcha Green Tea is the perfect compliment to your morning coffee, afternoon tea or your relaxing end-of-day indulgence. Whenever you have this snack, rest assured that you will be left with a feeling that this day just turned better. Every country has their own story to tell when it comes to culture, history, cuisine. This simple chocolate wafer tells us the story of Thailand, where every single Thai national would remember having had this chocolate wafer. The branding, the flavor, and the crunch, all of which would evoke memories of their homeland and would resonate within them - the sounds of their childhood. Pandan Leaves are very popular in Asia and are used widely in South-Asian and South-East Asian cuisines to enhance the flavors. It is these leaves which give jasmine rice, basmati rice it’s characteristic aroma. This snack is prepared by steeping these pandan leaves in coconut milk and then adding it to a traditional healthy Thai cereal snack. Jackfruit is inherently sweet tasting and is called the ‘queen of fruits’ in South-East Asia. It contains a high amount of nutrients like vitamins, minerals, electrolytes, phytonutrients, carbohydrate, fiber, fat and protein. It is also a good source of calories and contains no cholesterol or saturated fats. It is rich in antioxidants which protect from cancer, aging and degenerative diseases. These crispy rolls are light and crunchy by nature and are prepared using rice flour, whole coconuts and, jackfruits. They are popular all over Thailand. A very crisp tasty chip in the shape of little strips that is full of zesty spicy flavor. This quick bite can easily satiate any post-lunch, mid-morning hunger pangs or even a light midnight craving. A handful of this crispy Thai delicacy, and we can be on our way getting on with the rest of our day. These chips are cooked using the vacuum frying system, leaving the chips to be crunchy, crispy and delicious. More importantly, its nutrients and flavor are well preserved and amount of fat is reduced dramatically. Greenday's mixed vegetable chips include a tasty assortment of broccoli, okra, pumpkin and sweet potatoes. Meant for both adults and kids, they're the perfect way for the little ones to get their daily fill of vegetable nutrients without much fuss, and leave them wanting more! United Coffee Candies are crisp and densely rich, with a sweet but robust coffee flavor. This candy is perfect for people in need of caffeine on the run. These pack a strong punch, and will wake you up if at all you doze off at your desk. TopMunch was formed with a mission to educate people about the different cultures in the world. The learning curve is incomplete if people do not understand the native language, and with this, in mind, we present TopPhrase. TopPhrase provides our customers with basic phrases and their usages in each country so that everyone would be able to conduct basic conversations with locals of that country. This month, we are going to learn the phrases and usages that will most likely be required for all travelers to THAILAND. We, at TopMunch, aim to provide our customers the opportunity to experience the different cultures in its entirety. If you were to travel to this country, you would need in your kitty a guide to take you around the different local sights along with tips about how to gain an experience that can be preserved in your treasure chest of memories. With this in mind, we present to you our travelogue – TopTravel through which, we will not only be opening your eyes to the different sights in a country but shall also be helping you plan your next getaway or vacation to that country. We continue our journey to the beautiful country of Thailand. Asian tourists primarily visit Thailand for Bangkok and the historical, natural, and cultural sights in its vicinity. Western tourists also travel to the southern beaches and islands. The north is the chief destination for trekking and adventure travel with its diverse ethnic minority groups and forested mountains. CHIANG RAI: This city is full of ancient temples of which Wat Rong Khun (“The White Temple”) is the most famous. The artist who built it created a surreal representation of what he sees as obstacles to the path of enlightenment. KRABI: Krabi is a beach town on the southwest coast that boasts of crystal clear waters, pristine beaches, and impressive seaside cliffs. Once here, it is an absolute must that you head to the nearby Railay Beach (only accessible by boat) for what is undeniably the best sunset in the country. AYUTTHAYA HISTORICAL PARK: Ayutthaya is an amazing historic national park and a UNESCO World Heritage Center. It was destroyed in 1767 during a civil war with Burma and burned to the ground. Over the years, much of Ayutthaya has been unearthed to form an archaeological park. BANGKOK’s GRAND PALACE: Following the destruction of Ayutthaya (which was the then capital of Thailand), the capital was shifted to Bangkok where the Grand Palace was built. Do not miss the Royal Monastery of the Emerald Buddha, the upper terrace which has a Golden dome, a miniature version of Angkor Wat and a Royal Pantheon. During night time the palace is illuminated with lights making it a romantic sight to see. Visit the Golden Triangle - the point at which Burma/Myanmar, Laos, and Thailand meet. If you are in the vicinity of Si Narong Stadium during the third weekend of November, participate in the “Elephant Roundup”, where you can witness a two-day event which includes a variety of shows displaying the physical prowess and skill of the animals, such as soccer games and tugs of war with the Royal Thai Army. Elephants painting pictures, playing polo, and whirling hula hoops with their trunks are also incorporated into the show. Visit the Karen “Long Neck” Hill Tribe, where many of the women wear brass coil (weighing up to 30 pounds) wrapped around their necks. Do not miss out on visiting the Floating Markets near Bangkok. For Honeymooners–Phi Phi Islands is where we recommend you to go to. Thai people celebrate “Loi Krathong” during the month of November. As a respect to water spirits, Thai people release/launch small containers made of leaves/bread into the rivers, lakes. This festival coincides with a festival “Yi Peng” celebrated in the Northern parts of Thailand during which thousands of lighted sky lanterns are released into the air. Do participate in these traditional Thai festivals to better experience the culture. Rent a scooter, and drive it around like all the locals do. Visit Doi Suthep to see two things, firstly the view over all of Chiang Mai which is staggering and worth the journey on its own, and secondly the Wat Phra That Doi Suthep which is a temple dating back to the 13th century.